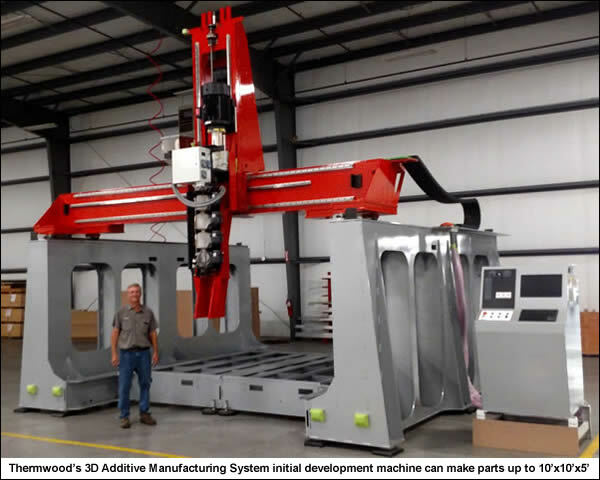 The Thermwood Multi-Purpose Five Axis Series combines all the elements needed for trimming of large aerospace and composite materials as well as machining large format patterns and molds/plugs for the aviation and defense industries. 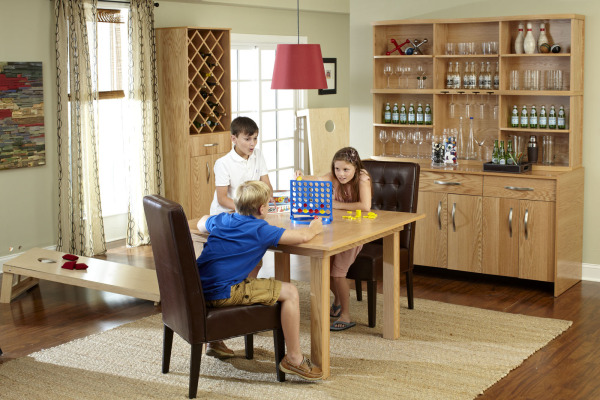 Here we look at the Thermwood Model 77. 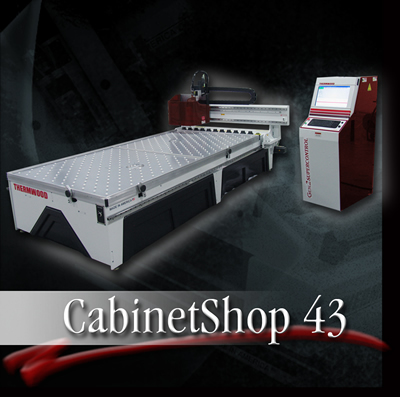 This heavy-duty, high-speed, moving gantry machine is ideal for machining large applications utilizing heavy fixtures. 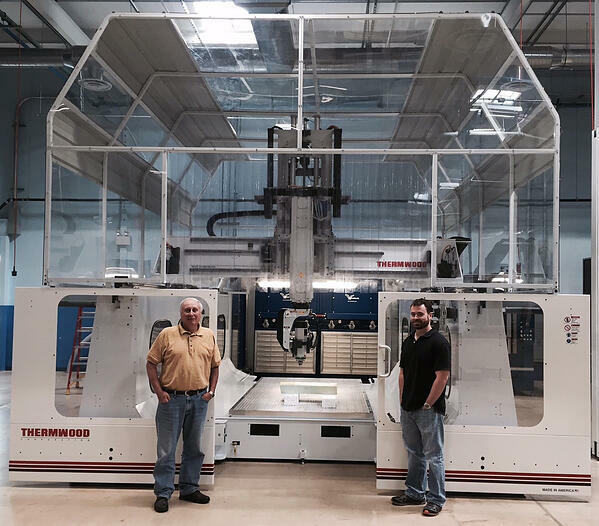 Lenny and Mike with their newly installed Model 77 5’x10’ 5 Axis CNC router featuring an enclosed overhead cap cover, 10 position rotary automatic tool changer, 36" Z Axis, gantry lighting system, access doors, Nemi pod table and rear dust extraction booth. Delcam's ArtCAM software enabled Adirondack Studios to complete successfully a project to produce five giant chandeliers for the Mohegan Sun Casino at Pocono Downs, Pennsylvania. For over 30 years, Adirondack Studios, based in Argyle, New York, has helped to design and build themed environments for theatres, arenas, exhibit halls, ballrooms, parks, restaurants, casinos, amusement parks, supermarkets, museums, stadia and marinas. About a year ago, the company began using the ArtCAM artistic CADCAM software to program the CNC routers used to manufacture the majority of the company's products. "The software that we used in the past for CNC programming worked fine for routine jobs but many of the projects that we get involved in are far out of the ordinary," said Bob Gregory, Senior Router Operator. "We spent too much time watching the clock while we were machining and ran into quite a few bugs. Also, the software developer was not as responsive as we wished when we called in for support." "We had heard that a number of our competitors were using ArtCAM with very good results so we decided to give it a try," Mr. Gregory continued. "From the very beginning we felt that ArtCAM was a more finished product, more robust, with much higher performance. The tutorials make it very easy to take advantage of the many advanced features of the software. The support provided by Delcam has been superlative and they do listen to, and implement, user suggestions for improving the software." 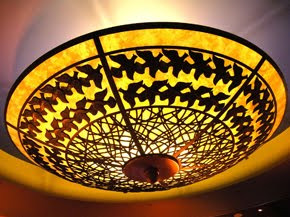 Adirondack Studios' designers began the construction of the chandeliers by building a 3D model in AutoCAD. 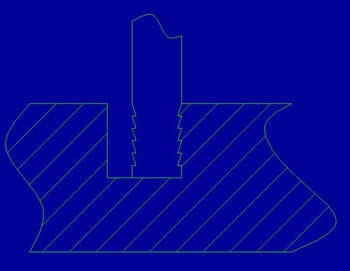 The file was imported into ArtCAM to generate the CNC program to machine a positive shape in low-density foam. This was used by a subcontractor to vacuum-form the plastic bowl segments. These were then painted to look like alabaster. In a similar way, the casting department used ArtCAM to make a mould to cast the grouse models that would be used to decorate the chandeliers. A black-tinted silicone rubber was used to give the grouse the appearance of wrought iron. The next step was to create a bird's nest pattern and weave it around the circumference of the bowl. ArtCAM allowed the ways in which the strands crossed each other to be varied for a more natural appearance. "Birds do not use a CNC machine to build their nests so it took considerable effort to get the correct look," Mr. Gregory said. Mr. Gregory generated a CNC program to cut the bird's nest negative shape into MDF. It took only fifteen minutes to create the program compared with at least four hours that would have been needed with the previous software. The mould was used to cast the bird's nests from the same silicon rubber used for the grouse. Finally, the birds and the nests were glued to the bowl of each chandelier. The finished chandeliers were then installed in the casino. They formed part of a $208-million renovation of the site, aimed at transforming it into the area's leading entertainment complex. Thermwood Joins the American Wind Energy Association! We are now a Business Member of the American Wind Energy Association (AWEA), and will be exhibiting at the Windpower Expo 2010 in Dallas, TX (May 23rd-26th, 2010). Make plans now to come out and see us in action. Thermwood offers 3 and 5 axis systems ideally suited for the production, fabrication and trimming of composites and other materials used in the production of wind energy products. For more information on our applications in this area, please visit the composite page of our CNC Routers By Applications area. Operators of chemical refineries, mining operations and power plants use cooling towers to reduce the temperature of process water that often contains corrosive chemicals. 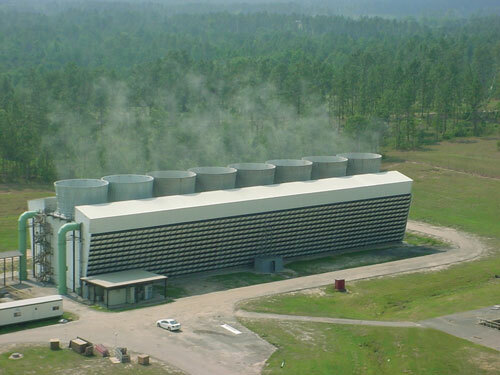 These large square or rectangular structures house equipment in which heated water trickles downward through filtration media while large fans draw air up through the wet media to transfer the heat to the atmosphere. Although cooling towers traditionally have been made with wood and concrete, composite materials are gaining acceptance due to their corrosion and rot resistance, light weight and ease of installation. "Redwood was used in the past because of its innate ability to resist rot. But, as good redwood became scarce, treated Douglas fir was substituted, and in addition to the negatives associated with the chemicals used to treat the wood, fir just couldn't hold up in the cooling tower environment," says Eric Kidd, cooling tower market manager at Bedford Reinforced Plastics (Bedford, Pa.). Bedford has pultruded square tubes, angles, channels and deck board for cooling tower alternatives since the mid-1990s, says Kidd, including one of the world's largest - a 46-ft tall, 54-ft wide, 1,080-ft long (14.2m by 16.6m by 332m) structure at Barrick Goldstrike Mines Inc. in Carlin, Nev. Bedford supplied more than 600,000 lb (272 metric tonnes) of pultruded components made with Owens Corning Material Solutions' (Toledo, Ohio) continuous filament mat and E-glass roving, Ashland Inc.'s (Columbus, Ohio) fire retardant polyester and vinyl ester resins and polyester surfacing veil. Drilling the thousands of fastener holes and cutouts that enable assembly and fastening of the tower's skeletal structure is a huge challenge. 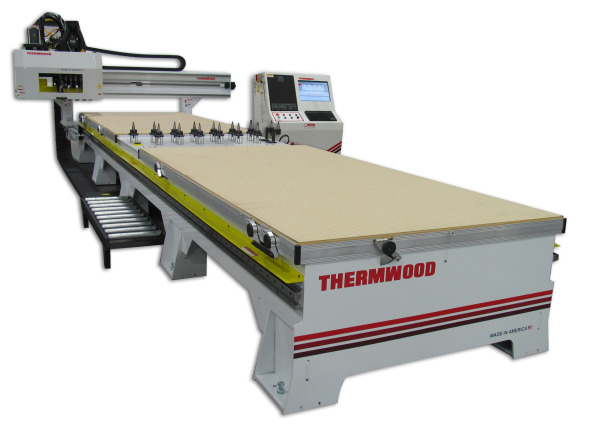 For that task, Bedford employs five 3-axis, CNC-controlled routers from Thermwood Corp. (Dale, Ind.). Configured with overhead moving gantries, the machines have bed sizes that range from 5 ft by 10 ft (1.5m by 3m) to 5 ft by 40 ft (1.5m by 12.2m). According to VP of marketing Jason Susnjara, Thermwood is the only CNC router manufacturer that supplies its own controller programs with the machines, enabling customers to seamlessly integrate CAD/CAM designs with the controller and postprocessor. Bedford considers automated drilling and cutting to be essential to optimizing finished-part production rates, hole consistency and location accuracy. The former, says Bedford, reduces product lead time, permitting the company to meet tight customer deadlines. 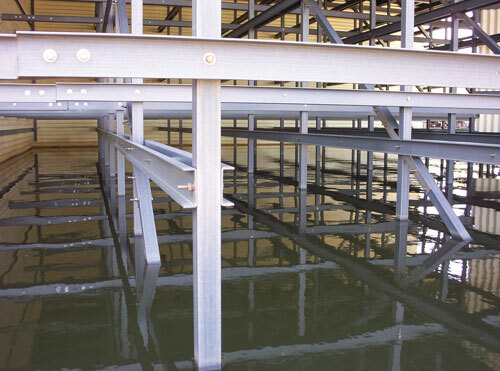 The latter ensures that tower structures assemble correctly on site, without delays for part rework. 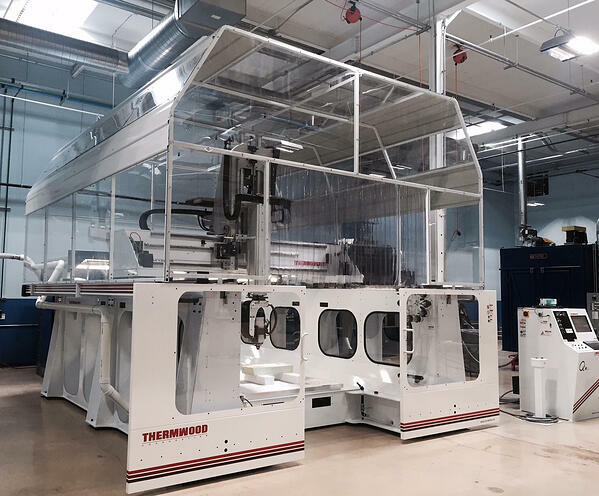 20-20 Technologies and Thermwood Corporation have joined together to offer a smoothly integrated, highly productive manufacturing system for cabinet manufacturers. 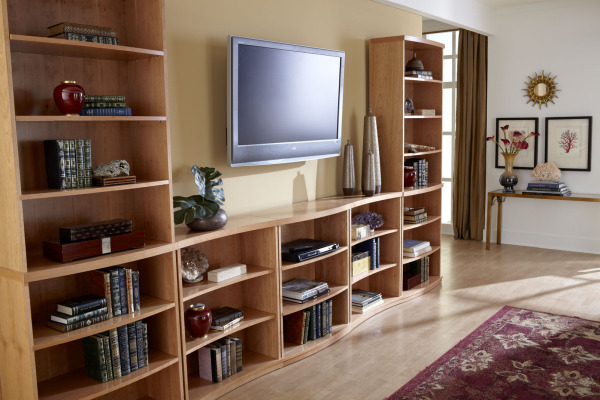 "We are very excited about this new partnership," said Ken Susnjara, CEO of Thermwood. "This represents a truly comprehensive approach from design and retail all the way through manufacturing, all working together smoothly and seamlessly. It combines the best technology of both Companies to create an industry-leading offering." The data process starts with the design. 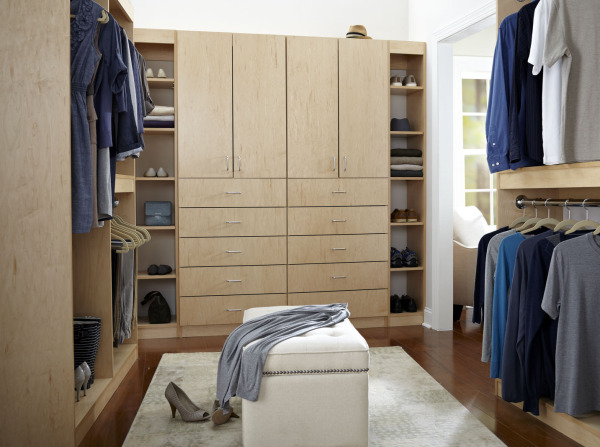 Over 50,000 dealers use 20-20 Design or ShopWare CAD to layout and sell projects. To machine a job, an output file from 20-20 software is sent directly to a Thermwood CNC router and the advanced CNC control on the Thermwood system automatically performs all required CAD functions, nests the parts, prints nest diagrams and labels and runs the job directly from full sheets of material. For even higher production volume, rectangular panels without additional machining are sent to an optimized panel saw, and only parts that require CNC machining are sent to the router. This not only increases overall production capacity, but represents an increase in productivity as well. "The advantages to using nested based techniques for machining instead of cutting all panels on a saw and then processing machined parts one at a time on a machining center are significant," said Craig Yamauchi, Executive Vice-President of Manufacturing & Residential Solutions of 20-20 Technologies. "Labor requirements are less and productivity is higher, sometimes substantially higher." 20-20 welcomes the opportunity to demonstrate the ease of use and high functionality delivered by this partnership for shops seeking best practices and robust integration at this year's AWFS show in July. 20-20 representatives will be on site to show how you can go from the showroom to the shipping dock with greater sales tools, lower costs, fewer errors and increased ROI.